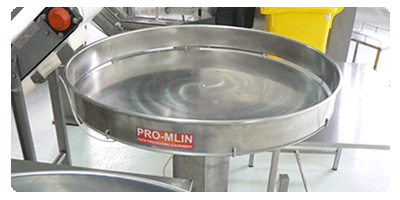 Rotary tables are usually made of stainless steel with dimensions according to client’s request. Rotary table have three-phase motor-reducer, which is controlled by the frequency converter. Shape of the table is such that operator can’t be injured. Tables have a system for raising and lowering, and a wide speed range of rotation. Rotary table of company PRO-MLIN has been accepted as a technical solution approved by the Faculty of Mechanical Engineering no. 1030/1, 2011. You want to send us a message related to Rotary tables.